Abstract: The aim of the project is modeling of the above-mentioned processes in MHD approximation and study of their supporting conditions, having fundamental significance. Abstract: The aim of the project of Ilia Vekua Sukhumi Institute of Physics and Technology (SIPT) is a complex research of renewable energy resources and technical and economic assessment of their possible usage in order to contribute to the sustainable development of up to 30 high mountainous, hardly accessible, not electrified villages. Abstract: The goal of the offered Project is the growth of multicomponent, high efficient thermoelectrical alloys of Si-Ge by the metal-ceramic and Czochralski growth methods and developing and testing of thermoelectrical generators on their base. •Solution of thermal physic problems. •Elaboration of construction of cryosorbtion pump. •Elaboration of technology of cryosorbtion pump. •Manufacturing and testing of high effective cryosorbtion pump (CSP-O.25 on the liquid nitrogen). •Manufacturing and testing of high effective cryosorbtion pump (CSP-O.5 on the solid nitrogen). •Experimental research of parameters of the cryosorbtion pumps. Abstract: Proposed Project provides development and investigation of radiation-modified materials of a new class with improved mechanical and frictional properties on the base of transitive metals; extension understanding of technological processes for producing ion-implanted materials by using the controlled high-fluence ion-implantation; investigation of the metals composition and structures at the implantation and its effect on the strength properties of metals by ion-implantation. Determination of radiation damage effects on the mechanical characteristics of the materials. The Project also foresees the study of proceeding main radiation processes; revealing and determination the mechanisms of change in the strength and tribological properties of implanted metals by various ions. Abstract: High temperature vacuum furnace and press system is necessary for high quality and effective work performance of mentioned works. Unfortunately such furnace and press system is not available in Georgia at present. Therefore funding of the submitted project will give a boost to the development of the most important scientific-technological trends in Georgia and will also expedite implementation of the research results in to country’s economy. Abstract: The goal of this project is to investigate the effects of doping of arsenic and antimony containing compounds (Sb2O3; PbSb2O7; HgSb2O7; As2O3; AsSbO3; Hg2As2O7) on the electric and magnetic properties of HgBa2Ca2Cu3O8+δ high temperature superconductors in order to find the optimal conditions for enhancement of the inter-grain critical current density and superconducting phase formation kinetics in Hg-1223 material. „Obtaining of ultra-dispersive aluminium oxide on basis of local resources and developm ent of producing of corundum ceramic products"
Abstract: The purpose of the Project is development of technology for obtaining of three main precursors of aluminium nitrates, isopropylate and aluminium hydroxide of different modification and obtaining of Al2O3 powders by their subsequent transformation (modified sol-gel method, reduction-oxidation reaction, co-precipitation method and others). The second purpose is development of technology for modification of alumina surface by way of introduction of inhibitors in the process of sintering of powders. Metal-organic compounds and complexes of magnesium, calcium, zirconium and silicon dissoluble in organic solvents will be synthesized for this purpose. 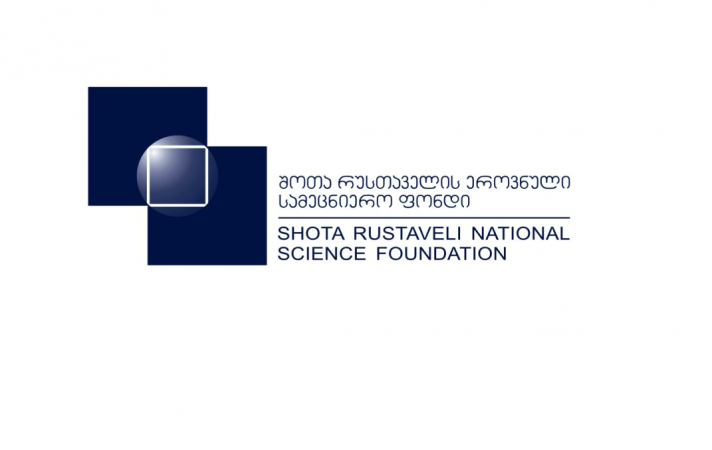 Co-funding organization: State Military Scientific-Technical Center "DELTA"
“International Scientific Conference on "Advanced Materials and Technologies"
Abstract: The Conference is aimed at gathering representatives of outstanding scientific schools dealing with the newest materials, technologies and latest researches; also exchanging useful experiences and ideas; analyzing current problems and discussing latest results; presenting materials science potential of Georgia, integrating science and technology latest results under the frames of the International projects. The essence of the Conference pertains to the analysis of high technology functional materials creation, diagnostics and application prospects. The Conference will highly contribute to the development of innovative technologies in Georgia and will widen partnership activities. Abstract: The Project objective is to develop processes for radical improvement of hardness and friction properties of Niobium, Molybdenum, Tungsten, AISI 310, 440 C type steels and balls of ball bearings. Among novel means to optimize material properties ion-implantation seems most promising one. Abstract: The main purpose of this project is to synthesis the TlBa2Ca2Cu3Oy and TlBa2Ca2Cu3NxOy (Nx= P2O5, V2O5; As2O3; Nb2O5; Sb2O3; Bi2O3), by using a sol-gel method involving the gelification of a solution by an in-situ polymerisation of acrylamide monomers. Moreover, in framework of project we also will be testing a various variant of this method in order to understand sol-gel processing and find better and rapid way for synthesize of Tl-based superconductors which will had high phase stability and superconducting properties. Abstract: The project objective is complex investigation of initial, thermally annealed and gamma -rays irradiated Si-Ge alloys’ bulk crystals and establishment of electrophysical characteristics, relaxation and hysteretic internal friction spectra, dynamic and static microhardness and mechanical module regularities. Abstract: Innovative neutron sensor will be applied for County's defense and nuclear and radiation safety, equipping troops and special purpose units, fighting against smugglers and terrorists. The sensors will be placed at the air, maritime and railway stations and border customs offices. Offered sensors could be used for: an environmental protection, nuclear energy devices supply, nuclear technologies, medicine, geology, chemistry, biology, and other fields of science and technology. The value and actuality of the project is accounted for the strong market demand on sensors and their wide-scale production potential, and also for widening ion implantation areas. Proposed sensor does not exist at the market. Competitive competence of the sensors is vivid and their commercialization is feasible. The realization of the proposed project will allow to produce new ion-implantation products in Georgia. Abstract: The goal of this project is to investigate the effects of precursor and influence of the various dopants on the electric and magnetic properties of HgBa2Ca2Cu3O8+δ high temperature superconductors in order to find the optimal conditions for enhancement of the critical current density and superconducting phase formation kinetics in Hg-1223 material. Abstract: The energy crisis and global warming are the greatest challenges to our society, which requiring an immediate solution. For this it is necessary to develop clean, efficient, cheap and sustainable energy storage devices. Enrgy storage devices are widely used in electro vechiles, portable electronic devices and other. The performance of the devices largely depends on the chemical compositions and structures of the electrode materials. Graphene/polymer hybrid nanocomposites have gained great attention as electrodes for energy storage because of their excellent mechanical, electrical and electrochemical properties . Principal objective of the project is to make novel materials for electrodes with improved properties for high current densities, for which purpose these materials should be of high capacitance.